Notes: Text and photos copyright © 2018 by Jane Fairburn. by JANE FAIRBURN You might recall that I promised to provide you with more information on the Durnan family of Toronto Island, whose roots extend back to the earliest days of European habitation on the sandy strand, when the little town of York was a mere outpost on the fringe of a vast and imposing wilderness. The Durnan family, immigrants from Belfast, Ireland, found their way to the Island in 1830s. 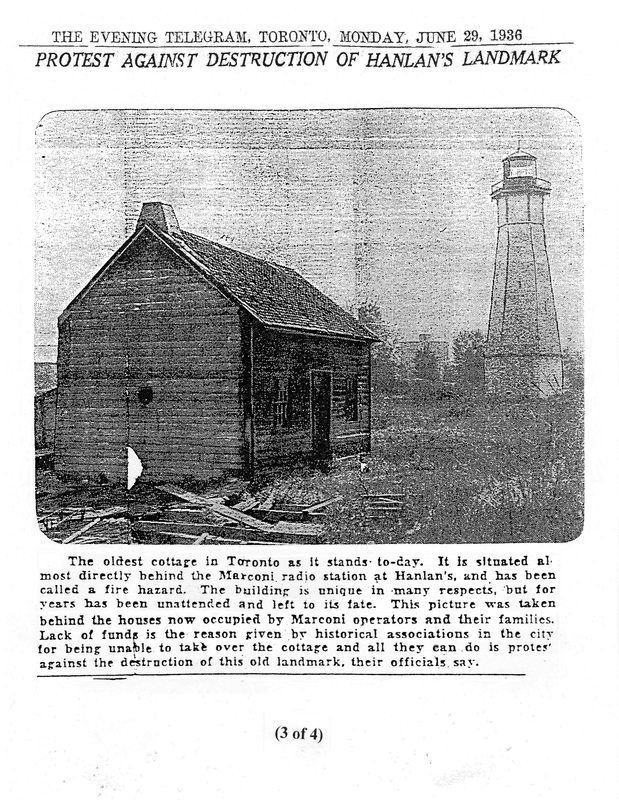 The patriarch of the clan, James, became the third keeper of the Toronto Island lighthouse in 1832 at a time when the Island, and by extension the Toronto shore, had by no means emerged from its pioneer period. Robertson’s Landmarks record the remembrances of James’s son George, who became the fourth keeper of the light in 1853. He remained in that position for well over fifty years, relinquishing his post shortly before his death in 1908. George Durnan recalled that from 1834 to 1840, Aboriginal people still occasionally camped on the Island. As reported in the Landmarks, “these children of the forest were fond of milk, and often came to the light keeper’s door and asked for a pitcher full and were seldom refused, if there was milk to spare.” The nineteenth century Durnans were likely unaware that their Aboriginal neighbours, the Mississaugas, held the Island (in their language, Menecing) to be a sacred place of healing ― a place to be born, and a place to die. Toronto Island lighthouse keeper George Durnan, 1853 to 1905, being interviewed by publisher John Ross Robertson, June, 1907, at the Evening Telegram, the art room, July 6, 1907. 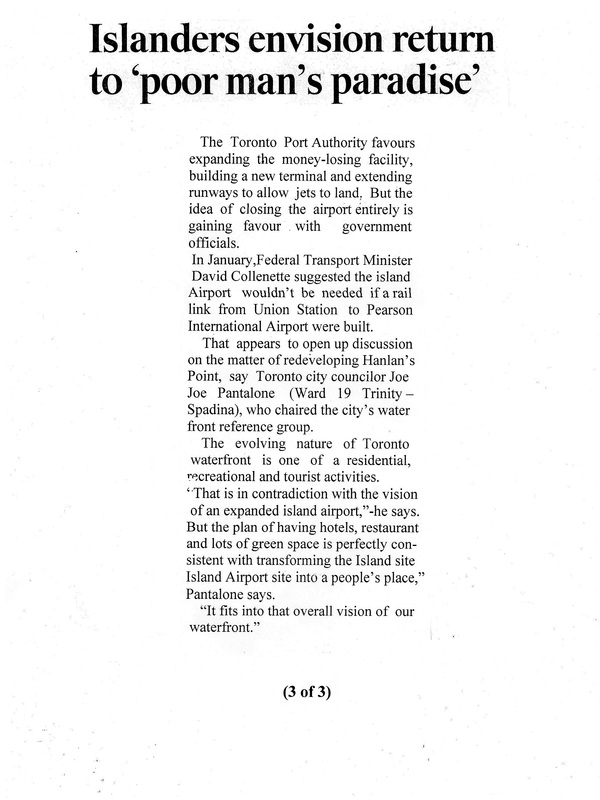 During the years of George Durnan’s tenure, Toronto Bay became a bustling hub of industry, commerce, and recreation. The Durnans and their kin were at the centre of all that. In the late nineteenth and early twentieth century Toronto Island produced several scullers of national and international renown, including the great four time world champion, Ned Hanlan. 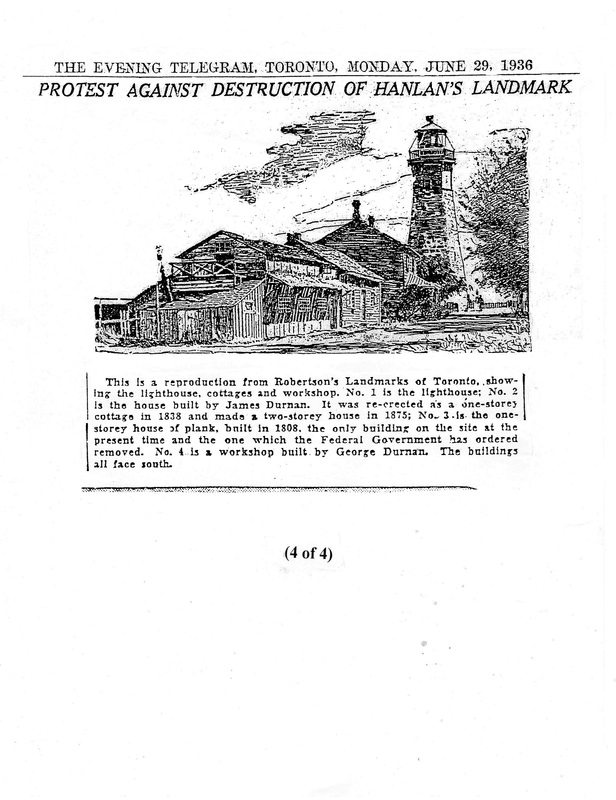 Hanlan’s sister, Emily, married ‘Boathouse John Durnan’, a son of the original lighthouse keeper James Durnan. Ned Hanlan’s nephew, master boat builder Eddie Durnan, was champion oarsman in America from 1912 until his death in 1928. Here is Eddie Durnan’s daughter, Hester Durnan, in his hand-crafted iceboat, c. 1920s. Courtesy Ted English and John Durnan Hudson. 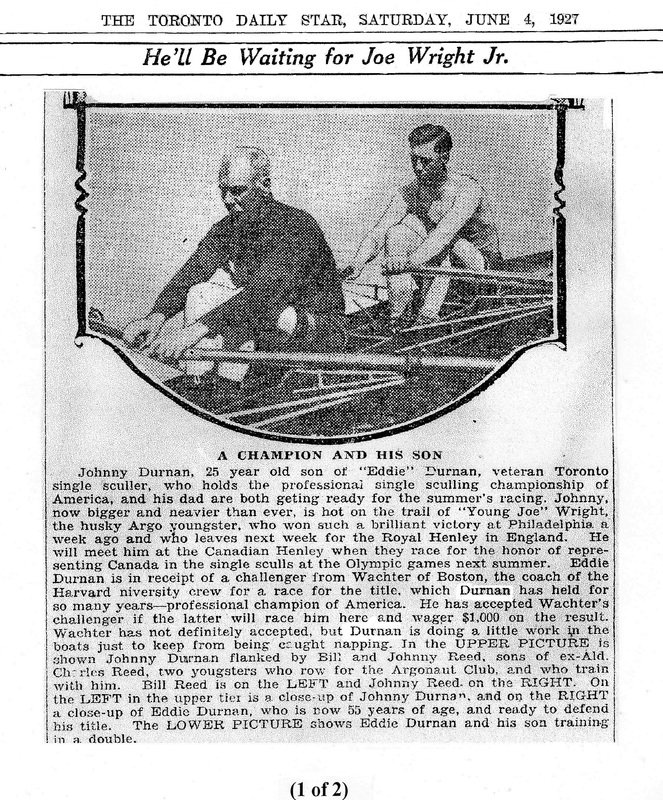 Eddie Durnan’s son, John Hanlan Durnan, was also a Canadian champion oarsman. The last proprietor of the fabled Durnan’s boathouse, he crafted his own canoes, rowboats, and punts in his boathouse workshop that overlooked the Lagoon. Most of these beautiful vessels were sadly lost when the Island community was decimated in the 1950s. Below is a marvelous photograph of John Hanlan Durnan’s father Eddie in his prime at Hanlan’s Point. The image was generously shared with me by his grandson, John Durnan Hudson, and his grand-nephew, Ted English. I love the painterly quality of this young athlete out in the Bay on a summer’s day. Eddie Durnan, John Hanlan Durnan, and Ned Hanlan himself were by no means the only members of their large family group to achieve sporting excellence. Another cousin, also a Canadian champion sculler, was local Toronto osteopathic physician, “Doc” Durnan, who, in his late seventies, would entertain the regatta crowd, by pressing up into a headstand in his rowing shell on the water! Bill Ronald Durnan preferred icy, rather than liquid surfaces, tending net for the Montreal Canadiens from 1943 to 1950, and was inducted into the Hockey Hall of Fame in 1964. Water, whether in its liquid or frozen form, has loomed large in the life of the Durnan family over the generations. The original ‘Boathouse John Durnan’, husband of Emily Hanlan, established Durnan’s boathouse on the edge of the Lagoon at Hanlan’s Point in 1870, according to great-grandson Ted English. Boathouse John drowned out in the Bay in 1874 ― the circumstances of the drowning remain somewhat of a mystery. 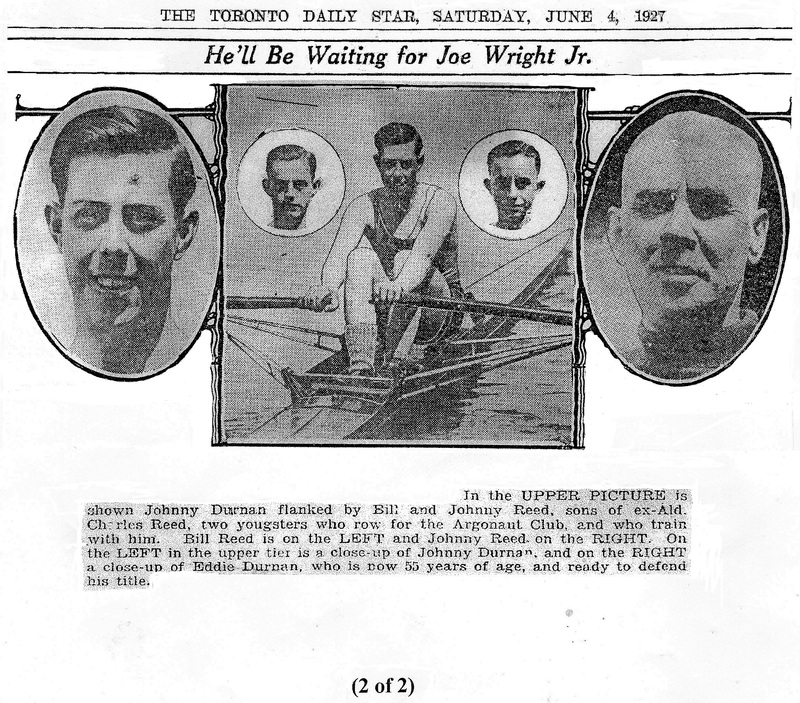 Many Durnans performed dramatic rescues in Toronto harbour, such as the incident in February 1922, when American champion Eddie Durnan, along with his son John, cut down the sheet rope of their iceboat and inched themselves over 400 feet of paper thin ice to rescue a man floundering in the icy waters. As the Evening Telegram reported, “As the drowning man was getting weaker and weaker, it was only by the presence of mind of the Durnans begging him to put the rope in a better position that they were able to get him on the ice. While the Durnans at this time were more or less exhausted and the man unconscious on the ice… he was dragged slowly foot by foot until the heavy ice was reached.” Both Durnans were awarded the Royal Humane Society’s award for lifesaving on that particular occasion. With no means of transportation to the mainland in winter prior to the introduction of ice breaking tugs in the 1930s, many Durnans became expert iceboaters. American champion Eddie Durnan was one of Toronto’s premier iceboat builders. 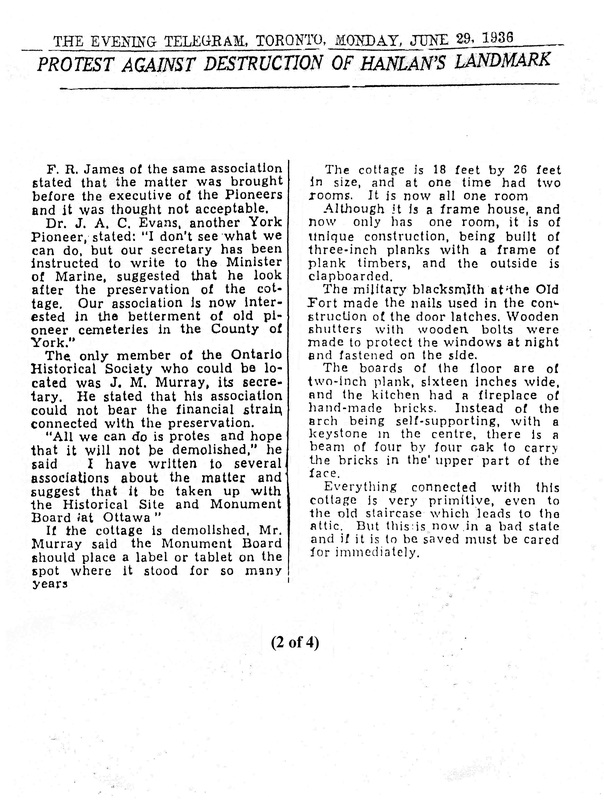 John Summers, in his article “The Coldest Sport in the World: Iceboating in Toronto Harbour, 1824-1941”, points out that Toronto retained its own unique style of steered from the stern, lateen-rigged iceboat, until the sport all but disappeared from the Bay in the 1940s. You can also read more about iceboating on the Bay and the remembrances of long time Islanders in Along the Shore. 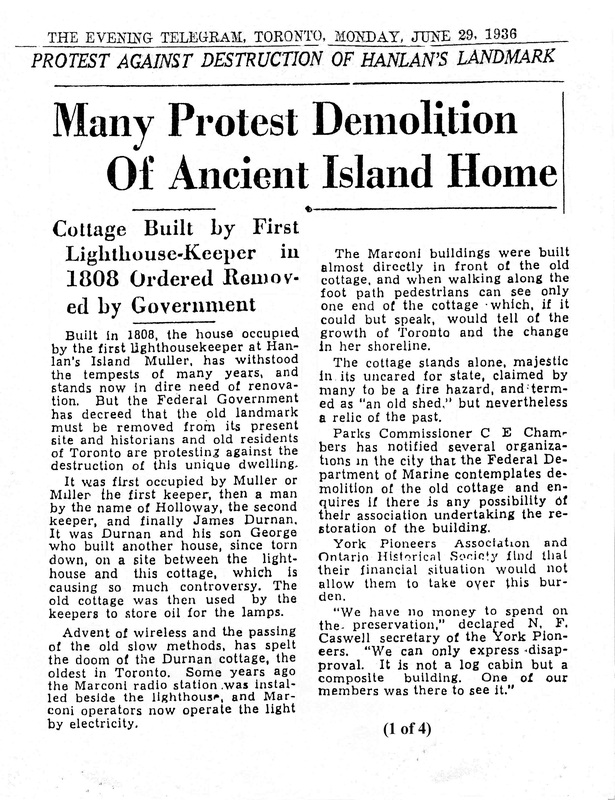 With a scandalous lack of regard for the past, the City of Metropolitan Toronto succeeded in obliterating the Island communities on Hanlan’s Point and Centre Island by the mid-1950s. Along with the death of the communities came the wanton destruction of numerous heritage buildings and crumbling estates of Toronto’s wealthy elite of an earlier era. By the early 1960s, many former Islanders had been absorbed into the fabric of the city, but Durnan’s rustic boathouse, a landmark on the Island since 1870, remained on the edge of the Lagoon, though eerily silent. I’m told that a crane parked at Mugg’s Island, armed with a wrecking ball and threatening violence, slowly crossed the Lagoon to Durnan’s boathouse one morning in the early 1960s. Without further adieu, it ripped into and systematically dismembered one hundred and ten years of history, that now lie buried under the earth. 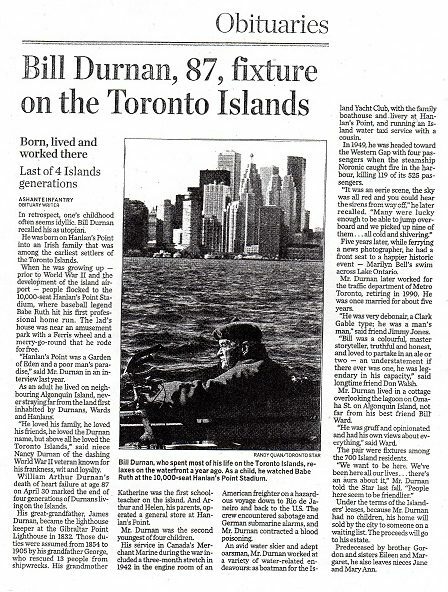 Though the vast majority of Durnans had left Toronto Island before the destruction of the boathouse, Bill Durnan, great-grandson of the original Durnan lighthouse keeper James, opted to remain. His home was fitted out with all the accoutrements you might expect of a fellow with pioneer lineage and an impressive marine heritage that spanned almost two centuries: a Great Lakes ship’s compass, life preservers from long gone Island ferries and ship wrecks, and antique bayonets, muskets and rifles. 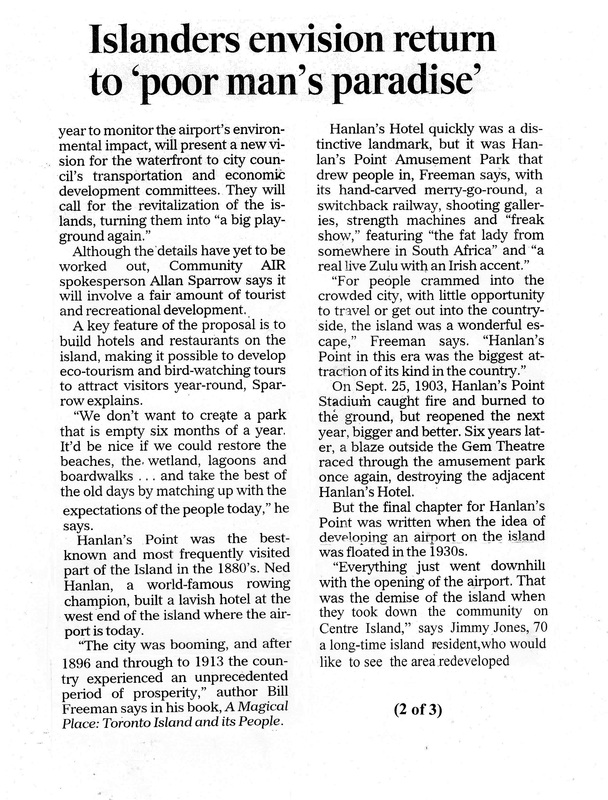 When Bill died in 2003, it signaled the end of an era in the life of the Island. The Durnans had had a great run, but they had moved on. 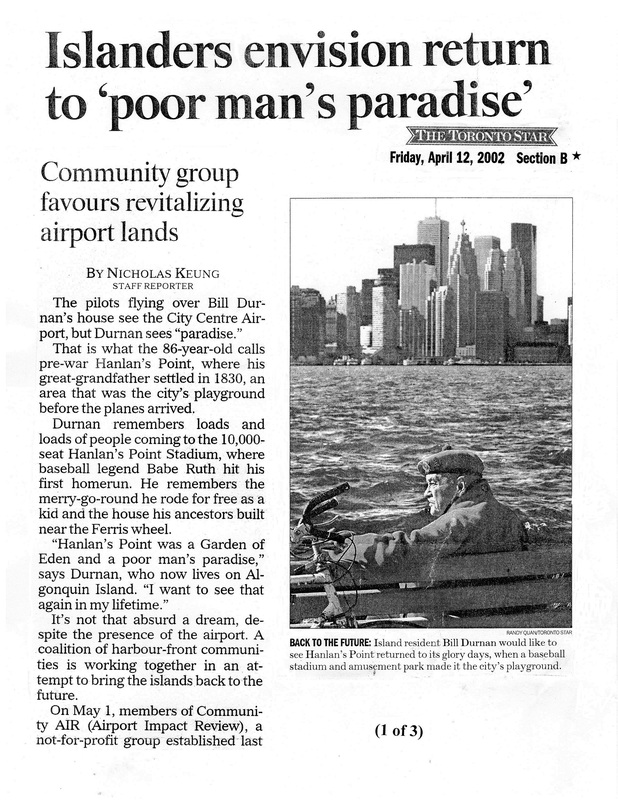 You can still go and visit Bill and all the Durnans with fond memories though ― his commemorative bench sits on Ward’s Island, overlooking the Bay. 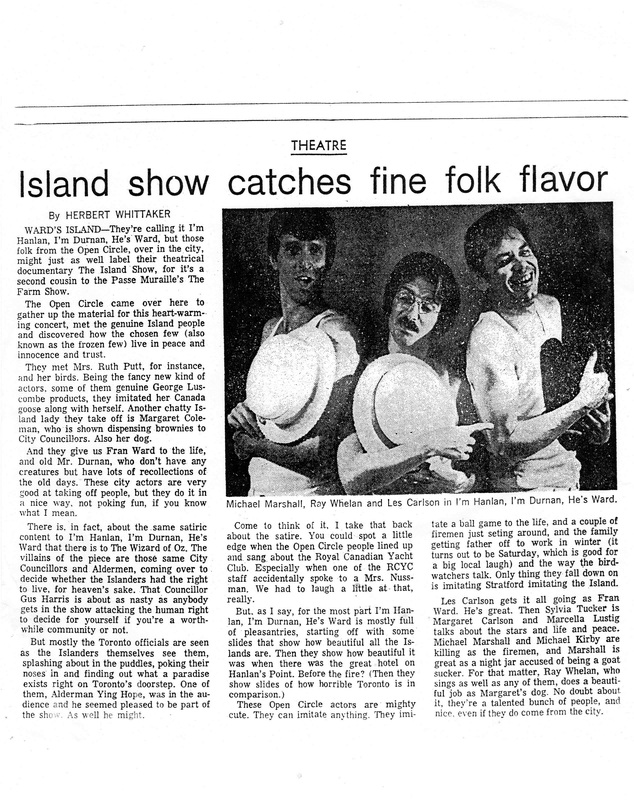 Many thanks to Ted English who assisted me with the preparation of this article. He’ll be waiting for Joe Wright, Jr.